BEIJING, Sept. 1,Chinese President Xi Jinping on Saturday met with Seychelles President Danny Faure ahead of the 2018 Beijing Summit of the Forum on China-Africa Cooperation. With profound traditional friendship, China and Seychelles have always treated each other sincerely, friendly and equally, and always been committed to unity, cooperation and joint development, Xi said. China supports Seychelles in independently taking a development path suitable to its own national conditions, and is willing to keep close exchanges with Seychelles, enhance political mutual trust, and engage in cooperation in the fields of people's livelihood, infrastructure, tourism and maritime economy, Xi said. China is aware of the multiple challenges Seychelles is faced with as a small island nation and is ready to increase South-South cooperation with the country on tackling climate change, Xi said. China welcomes Seychelles' active participation in the Belt and Road construction by giving full play to its favorable geographic location, Xi said. For his part, Faure said, with traditional friendship, relations between his country and China have been increasingly consolidated. Seychelles sees China as an important partner, and thanks China for the long-term precious help, Faure said. 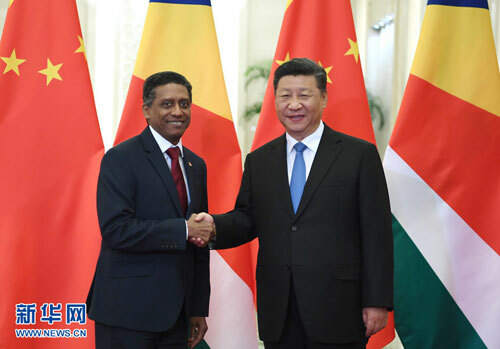 Seychelles is ready to enhance communication with China on governance, take the joint building of the Belt and Road as an opportunity to conduct more bilateral cooperation, support each other in international affairs, and lift bilateral ties to a new height, Faure said. The two leaders witnessed the signing of bilateral cooperation documents.